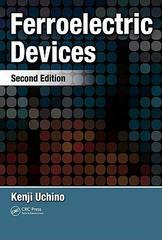 This versatile reference/text provides a comprehensive introduction to fundamentals of ferroelectrics, including available materials, device designs, drive/control techniques, and essential applications­examining high-permittivity dielectrics, piezoelectric devices, pyroelectric sensors, and electrooptic devices. Containing over 800 references, drawings, and photographs, this text serves as an excellent reference for materials, electrical, electronics, optical, electromechanical, solid-state, and robotics engineers, and a superb text for upper-level undergraduate and graduate students in these disciplines. This book offers a detailed and well-organized outline for a full-semester course in ferroelctric materials engineering, as well as example problems and end-of-chapter problems­making the book an ideal text for students or self-study guide for professionals.